Maker of Dearfoams slippers has increased payout each year since 2010. Like a pair of big, comfy slippers, investors can slide their feet into consumer products accessories maker R.G. Barry (UNKNOWN:DFZ.DL), as they will receive a quarterly cash dividend of $0.09 per share on June 4 to shareholders of record at the close of business on May 20 for the fiscal third quarter of 2013. That rate is the same it paid last quarter when it raised the payout 12.5% from $0.08 per share. Barry has raised its dividend every year since 2010 when it began paying a regular quarterly dividend. Its primary brands include Dearfoams slippers; Baggallini handbags, totes, and travel accessories; and Foot Petals premium insoles and comfort products. 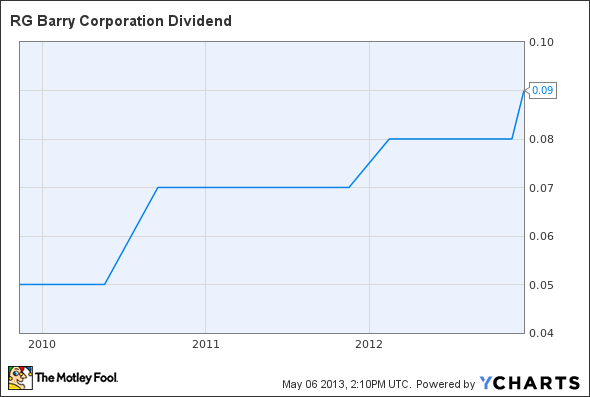 The new dividend annualizes to $0.36 per share, and yields 2.6% at the closing price of R.G. Barry's stock on May 3. DFZ Dividend data by YCharts.